One protester has been killed and 27 injured during Friday's clashes with police near the US embassy in Cairo as the anti-American protests in the Egyptian capital continue. Demonstrators have been throwing stones, waving banners, and shouting slogans. Security forces used tear gas on the protesters as they attempt to contain the crowd. Cairo police erected a wall of concrete blocks around the US embassy in an attempt to prevent protesters from entering the compound. Barbed wire was also placed on the roads near the embassy. Armored vehicles are being deployed near the embassy. "There is tear gas everywhere, and people are shutting up their shopfronts to block themselves off as the crowd escapes," reports RT's Paula Slier. 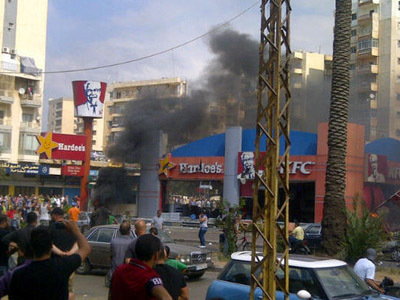 As clashes continue, some 100 protesters fled the scene amid arrests, Cairo-based journalist Bel Trew reported on Twitter. 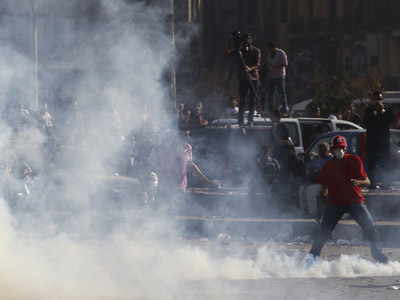 Tensions remain high in Cairo with police making extensive use of tear gas in retaliation against stone-throwing. Armored vehicles are pushing the crowd back as police fire rubber bullets at demonstrators. 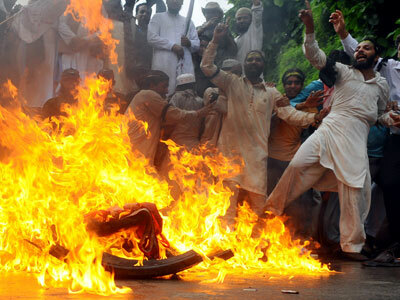 Anger has gripped the Arab world over an amateur anti-Islamic film directed by an American, which ridicules the religion and its revered figures. 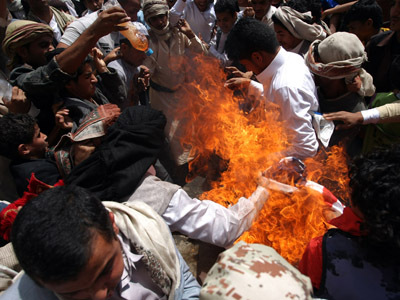 In several countries, the anti-American sentiment triggered violent clashes near US diplomatic facilities, with protesters throwing stones and setting cars on fire, with police using tear gas to disperse the crowds. 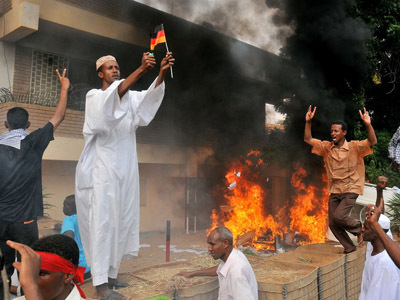 Egyptian President Mohammed Morsi called on the country’s Muslims to protect foreign embassies. Meanwhile, his political opponents, the Union of Political Parties have called Morsi's response "weak", and have called on his sons to give up their US citizenship in protest at the film. Away from the capital in Sinai, radical Islamists have attacked a UN peacekeepers camp, and put up a banner proclaiming "There's no God but Allah, Mohammed is the Prophet of Allah." FOLLOW RT’S LIVE UPDATES ON THE PROTESTS HERE.